Falun Gong is a practice of meditation and gentle physical exercises. The three basic principles of it are truthfulness, compassion, and tolerance. Practitioners try to achieve a state of selflessness and inner balance. It claims to not be a formal organization, have a cost or a membership. The Chinese Communist Party (CCP) came to see Falun Gong as a threat to it's monopoly. In 1999 Jiang Zemin issued a letter to eradicate Falun Gong. Falun gong practitioners in China have been tortured or have disappeared. 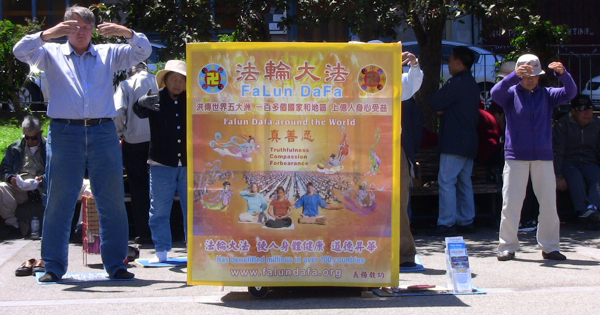 The Falun Dafa information center reports that over 3,400 have been killed. Huge money is being made in China from transplanted organs. Waiting times for organs in China are very short. This suggests a large bank of organs. Representatives in hospitals from 14 provinces in China say that their organs come from Falun Gong practitioners. Family members have observed the bodies of practitioners with their organs missing and many were cremated without consent. 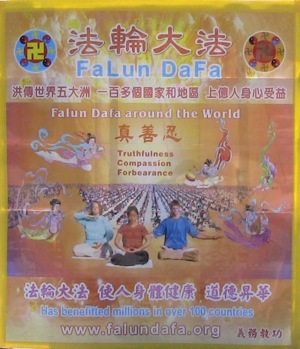 Falun Gong has been persecuted by the CCP since 1999. It was in that year that the number of organs transplanted in China drastically went up. I first came across Falun Gong while living in Shanghai. While there adherents showed pictures of practitioners being tortured and passed out information about the practice. I came across it again here in Chinatown, San Francisco. Here they are doing much of the same thing on Grant Avenue and in Jefferson Park. Adherents solicit people and pass out flyers that talk about the practice and about the persecution in China. One of the flyers also mentions a book that can be bought as well. To me it does seem a little cult or religious like. One women told me it spread by word of mouth throughout China. However, here it seems more like promotion and a religion to me. It doesn't look like it's being spread by word of mouth. It looks more like soliciting. I asked an adherent of Falun Gong why the CCP persecutes it and she said it's because the CCP is against the ideas of compassion, tolerance and truthfulness. I wonder also if it is because of it being religious like. The CCP does not tolerate religion.